Christine Nguyen represents the latest embodiment of “New Art” in America…multi-disciplined, highly expressive, fresh and techno-savvy. Her interpretation of the unseen combined with a humble reflection on sentient beings–things, and her deep understanding of visual media speak to a focused, yet liberal approach. 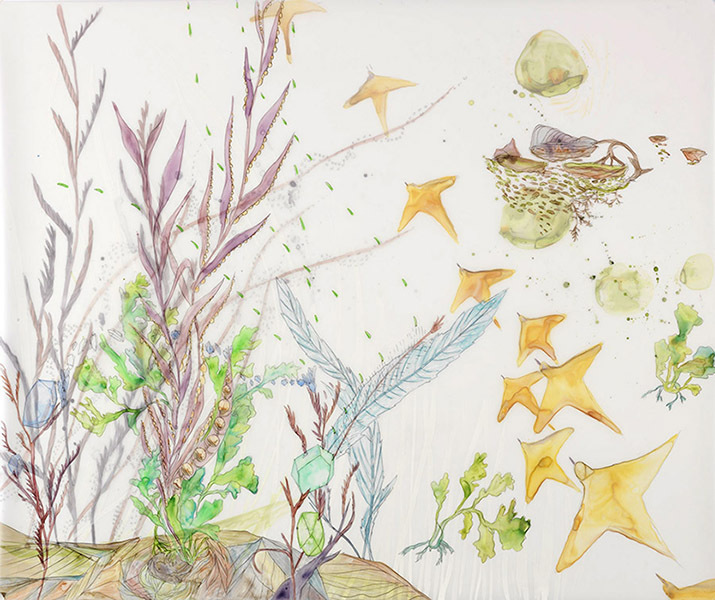 In her own way, Nguyen provides a cutting-edge artistic template, demonstrating how art and artist can and should function in the public and private sphere. 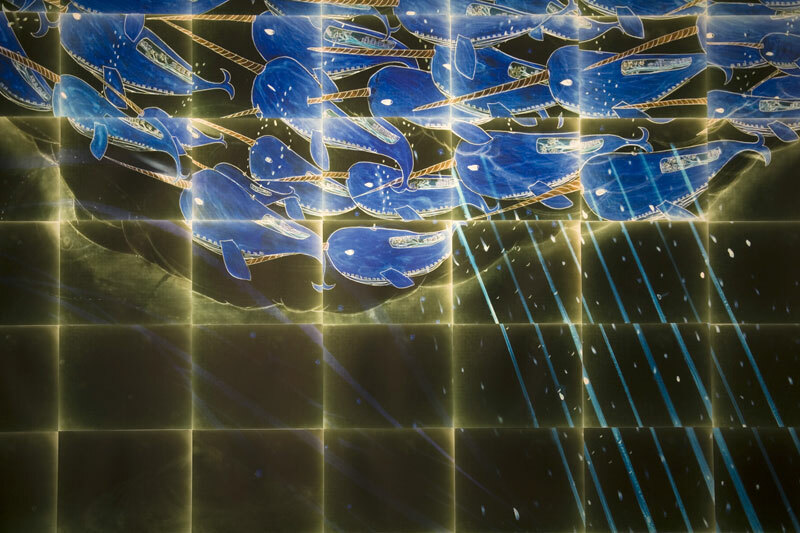 Much like another artist recently interviewed at AD Mag, Sally Grizzell Larson, Nguyen has a reverance for the natural–interpreting a distillation of oceanic and cosmic phenomena through her own supernatural lens of imagination. Her creations have a potent presence. Nguyen’s pieces are stunning, beautifully composed, rare, unique and interesting. 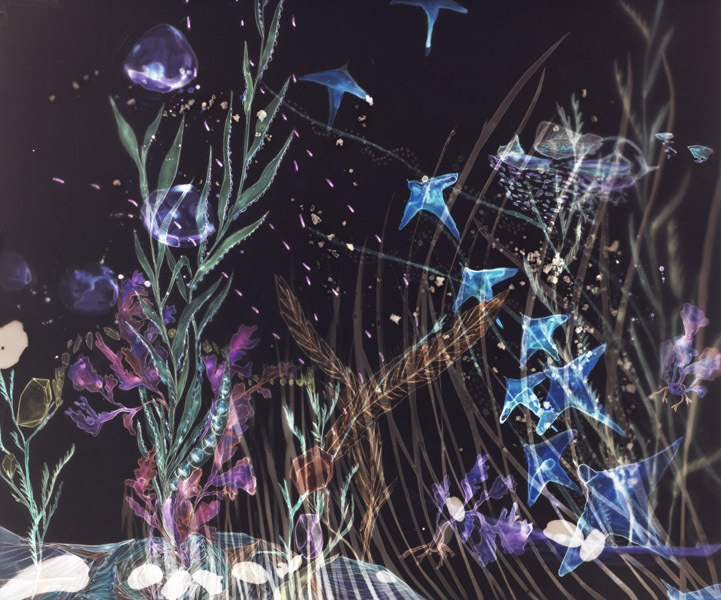 Creating photo-esque C-Prints and assorted mixed-media drawings on Mylar, it is impossible to ignore what she’s doing, all the while wondering how it’s done. Being a long-time fan of the independent record labels, especially the ones that sprung up in the early 80’s, like 4AD, I find myself intoxicated in a symphony of visual “sounds” like the otherworldly lullaby’s of the Cocteau Twins or This Mortal Coil…each and every time I’m in the presence of Nguyen’s harmonic imagery. I was just looking over your resume and it seems you keep a very busy exhibiting schedule. It seems like a lot to manage? I think it’s good to be busy. I usually don’t know what is going to come up next and it’s all unpredictable. I take it as it comes and grateful that things come my way. I ask that question, because I think it’s important for less experienced artist to understand how much of a commitment goes into having a successful art career. It’s definitely work; a real effort. The business side of art requires much focus, wouldn’t you say? It does require a lot of commitment and effort. I feel like I’ve been working at it since I was an undergraduate student. I would try and exhibit my work anywhere, from coffee shops, random juried art shows, and such. You really have to start somewhere and you never know who will see your work and who will remember your work in the future. You have to put yourself out there no matter how intimidating it may be because you’ll always learn something from it. As far as the business side of it, I’m still figuring that out. So tell us a little about yourself. Where are you from? I was born in Mountain View, California, but grew up in San Jose. Do you come from an artistic family? Well, my mom is pretty crafty and my father is pretty talented in building things. I’m sure I inherited some of that. Where were you trained, and how long would you say you’ve been an artist? I went to CSU Long Beach for undergraduate where I studied photography and then went to UC Irvine for grad school for Studio art. It’s hard to say when I started to be an artist. I’ve always been into making things since I was a little kid. I think shortly after school I started to tell people I’m an artist. 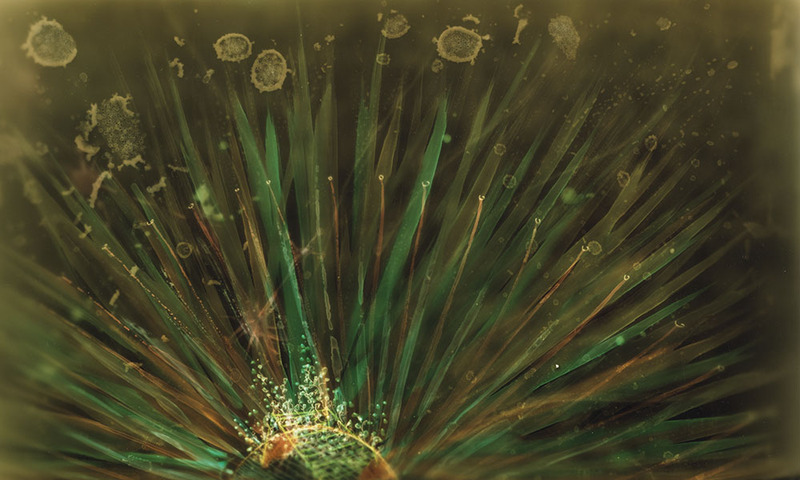 I was thinking of the ocean floor and the plankton floating and then would day dream of it being in outer space. My drawings are quite intuitive sometimes. I was doing a residency at the Headlands Art Center in Sausalito, CA when I was completing the second half of the piece and was quite inspired being in that area. The Marin Headlands is beautiful and surrounded by nature I saw various colors in the rocks, soil, and succulents which inspired me to paint the multicolored mountain like images in the works. The piece is reminiscent of a day dream. You do drawings and photography, which came first and why? I would have to say, I’ve always been a drawer since I was a child, but also became interested in photography when I started using my dad’s camera when I was in Junior High. In High school, I took both photography and art classes and in college I decided to focus on photography. Towards the end of my studies, I realize I could incorporate the two (drawing/painting and photography) through my photographic process. I’m attached to both mediums and it’s difficult to separate the two. I do think my drawing skills got better when I focused on it more in graduate school. I like your work because it demonstrates technical proficiency, feminine sensitivity, artistic articulation and a sort of peek behind the ethereal veil of nature and the cosmos. That’s my interpretation, but how would you describe your work—the place within, where it comes from? It comes from my interests in nature and space. 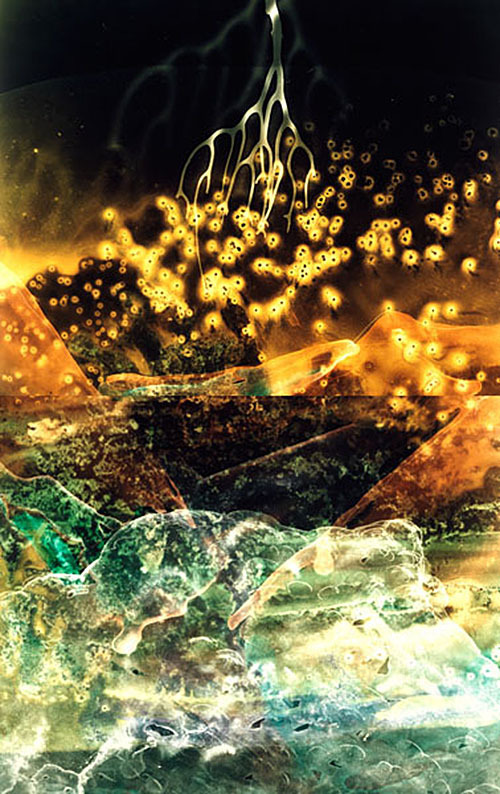 I have an interest in the micro and macro-worlds and how both worlds are very similar and how everything is connected to one another. And I also have an infinity to the ocean as well. My dad was a commercial fisherman and I was fascinated to see the various things he would pull up from the ocean while growing up. So, tell me about this installation you did in 2006 at the Armand Hammer Museum. I’ve seen photos, but it’s difficult to get a full understanding of the scale of the project. 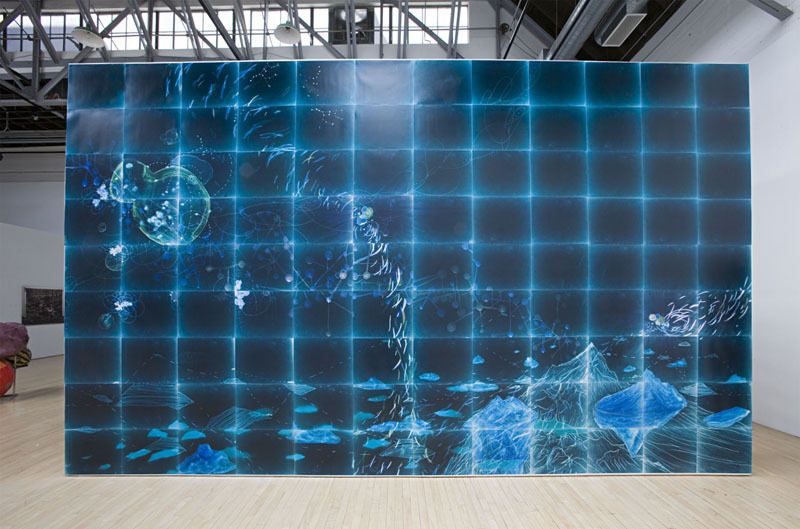 How many rooms and walls did the installation encompass and why did it end up being presented at that particular venue? 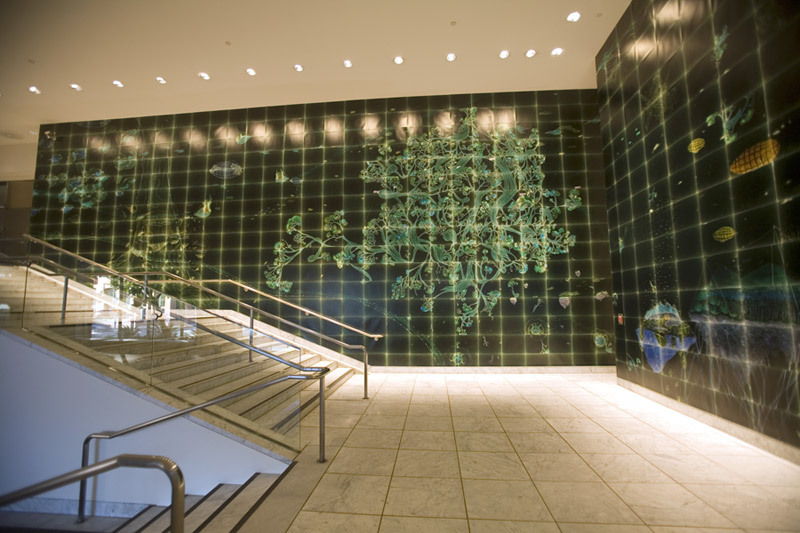 The project was in the lobby of the Armand Hammer Museum. There were three different sized walls- the largest being about 20 ft. height x 40 ft wide. I envisioned the piece going from left to right as you entered the building from the street. You could see the journey and transformation of the bird like creatures being transformed into narwhal like creatures in the end. The piece worked in that space because you could see it from the outside too. 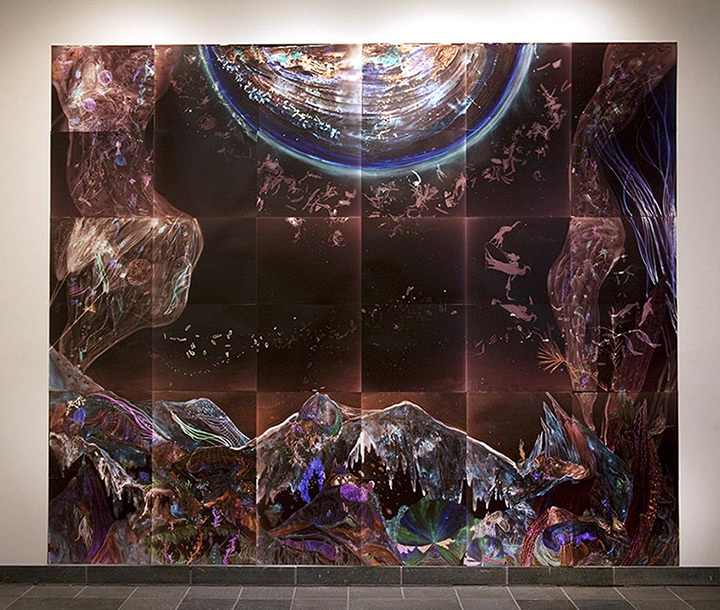 People walking by, taking the bus, or driving by at night could see the piece. It had this glowing effect that made it look like it was back light, but when in fact it’s just the nature of the photographic pieces. I am familiar with C-prints, but for those that may be unaware of what they are—how they are produced—could you talk a bit about that? Why do you use that medium and process? 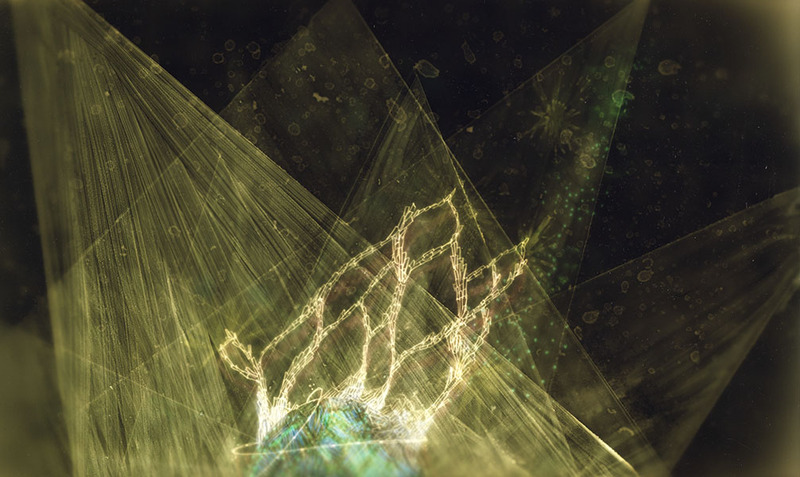 The photo-based works is a combination of drawing and a photographic processes. 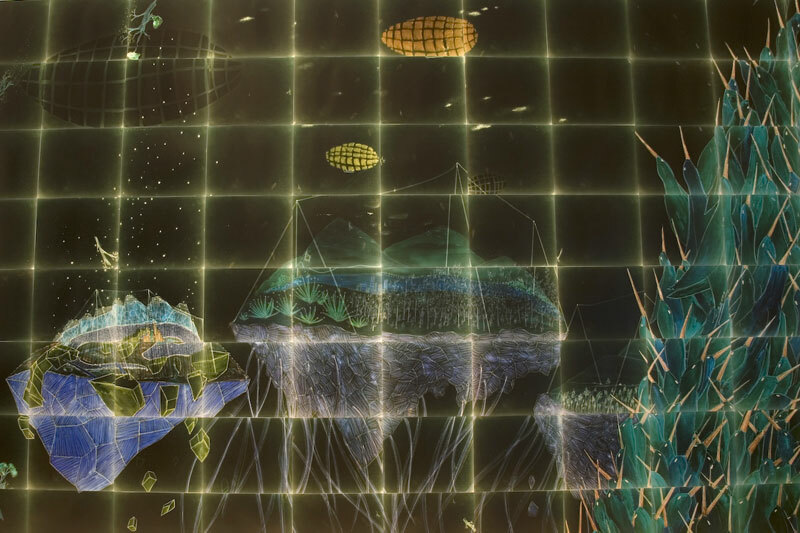 “Negatives” are drawn on layers of Mylar, which are projected onto light-sensitive paper. The paper is developed in a color processor, creating a camera-less, photographic image. What you are seeing is a negative of the drawing. 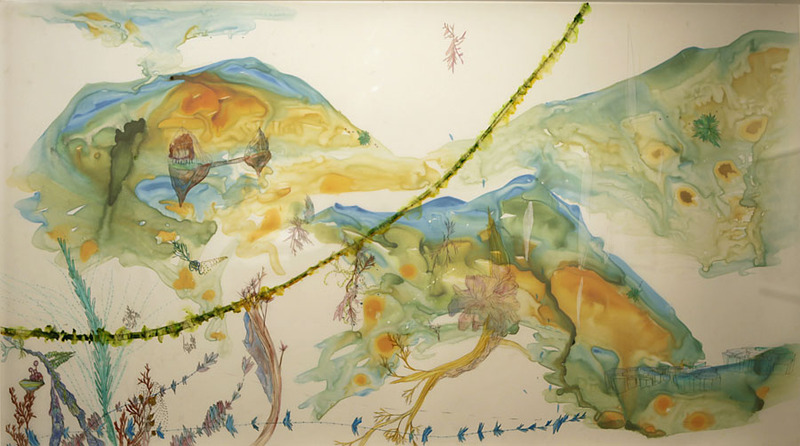 I use paints, inks, pens, pencils, and also grow salt crystals on the mylar to create my drawings. The photographic process creates a glowing effect that I appreciate. I often tell artists that I encounter how much I love their work. It sometimes feels like I’m just saying it because I’m interviewing them for the magazine, but truly that’s not at all the reason. Quite frankly, most of the art I see these days, I have no interest in. Because, a lot of it is insensitive and ugly–so much work out there is just not beautiful. It’s not beautiful, there I said it. But your work…it’s very, very beautiful—so alive—sentient and present. The colors and figures and light—all elements come together in an ever so quiet symphony of naturalistic wonder, magic and harmony. The art you create is bold and commanding, but also soothing–serene. That’s a tremendous feat. Thank you, you are much too kind with your words. I often would like to think that my work offers some sense of harmony or meditative escape from our chaotic world, but also a sense of awareness to our environment. So, it’s nice to read your impression of it. “The Great Bear Writes A Song For the Cryosphere”, now that’s a great piece. But what’s a Cryosphere? What’s going on in that work? The Cryosphere is part of Earth’s surface that is frozen from water which includes glaciers, snow, ice caps, etc.. At the time I made the piece, years ago, Ursa Major (The Great Bear) constellation was in clear visibility in the spring time sky which was a coincidence. Also, I remember watching a nature documentary about the polar bears and the melting glaciers. It was heart breaking. I thought I would make something for them, as if it would help in some way. But, besides that I find glaciers to be amazingly beautiful. I look at your work and I see, for instance in the piece “Rockweels and the Blue Skates Escape”, an East-Asian composition kinda like an Ikebana or of the style of art I’ve often seen along side haiku poetry. Too, with the color and all the luminosity, you work also reminds me of Dale Chihuly’s glass sculptures. Your thoughts on this? Art is pretty subjective and everyone brings in something personal with them to work. So, it’s great to see what you see in it or to make reference to. I do like the idea of Haiku poetry with some of the compositions in my work, but I can’t say it’s something that is intentional. 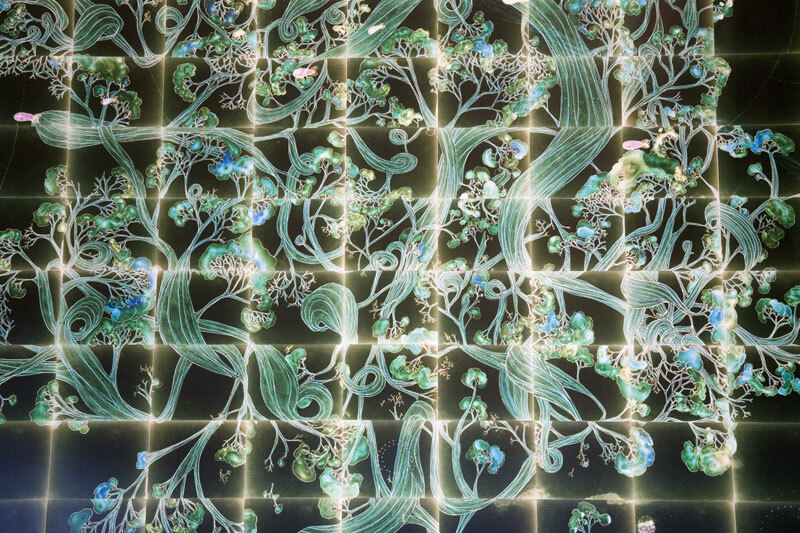 I could see how the work reminds you of some of Chihuly’s work because of the organic nature form of his pieces, but his work isn’t something I really look at. Christine, thank you for taking the time to speak with me and keep in touch, because I definitely want to talk with you again as I expect your career to blossom quite well. Thanks for your kind words, Max. I appreciate your interest in my work. A full listing of archived interviews can be found here. Visit the AD Mag artist galleries here and Christine Nguyen’s website here.